Drax Group, the largest conventional power station in the UK, is converting to burning sustainable biomass in place of coal – a process which has seen the station transform from the UK’s largest emitter of CO2 to Europe’s largest decarbonisation project. A major part of this project is the introduction of new rail freight wagons, designed by Lloyd’s Register Rail and capable of carrying over 70 tonnes of compressed wood pellets, a 30% increase over conventional wagons. 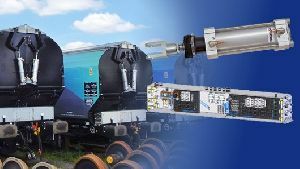 Over 200 of these new wagons have been manufactured in the UK by WH Davis Ltd., each equipped with a fully automated pneumatic control system manufactured by Rotork Midland. The Rotork Midland design enables all controls, hand valves and visual indicators to be located in one place, providing safe and convenient access. The innovative design allows any wagon in the rake to be the arming wagon. Top and bottom hopper doors are operated by a magnetic sensor valve from a lineside magnet.